OHL Midwest Division action comes to Sportsnet this afternoon as the first place Kitchener Rangers (25-12-2-0) pay a visit to the Owen Sound Attack (14-16-1-5) on the CHL Saturday Showcase. Both clubs come off Friday night losses as the Rangers look to rebound from a 6-2 home ice defeat at the hands of the Mississauga Steelheads. Florida Panthers prospect and Rangers leading scorer Adam Mascherin saw a 15-game point streak come to an end last night. The 19-year-old has 52 points (28-24–52) in 39 games this season while other offensive contributors in captain Connor Bunnaman (17-18–35), undersized playmaker Joseph Garreffa (7-34–41) and speedy winger Kole Sherwood (14-16–30) have also been go-to options for head coach Jay McKee. Today marks the seventh of eight meetings between the Rangers and Attack this season, with Kitchener having won four of the six encounters thus far. 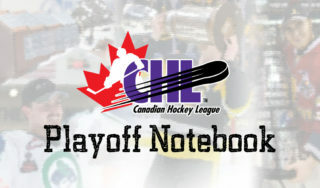 Owen Sound looks to turn the tide on what’s been a trying month. The Attack enter play on a seven-game slide following a Friday night loss in Guelph. 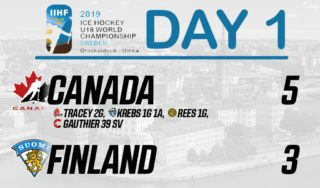 The Attack have been without the services of Canadian World Junior gold medalist Jonah Gadjovich, Belarus team captain Maksim Sushko and injured veteran forward Kevin Hancock of late, but look to make the most of a big opportunity with new addition Brett McKenzie making his home debut before a national audience today. Vegas Golden Knights first round pick Nick Suzuki leads Owen Sound on the scoresheet with 48 points (18-30–48) in 32 games while 19-year-old defenceman Sean Durzi trails close behind with 44 points (15-29–44) to his credit. 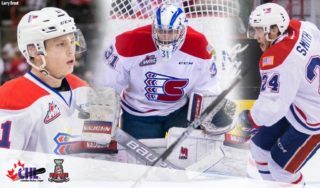 Catch all of the action live on Sportsnet as RJ Broadhead and Sam Cosentino provide the call at 3:30pm ET/12:30pm PT. After a great time last week in Brandon, Man., the 100th Mastercard Memorial Cup Tour stops in Quebec City this weekend as the host Remparts take on the Shawinigan Cataractes and the Sherbrooke Phoenix in back-to-back home games on Friday and Saturday. For full coverage of the tour, visit mastercardmemorialcup.ca.